"It's not just a tree we are trying to protect here. It is a whole environment," says Antonio Ferreira, who has been a land owner and cork farmer in the Coruche district of Portugal for many years. "The forest you see around you now has been like this for hundreds of years. It is meant to be this way". 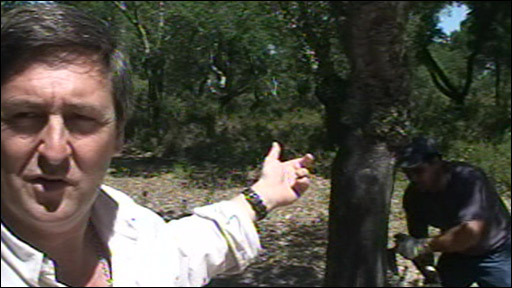 Antonio points to the cork oaks whose roots hold the soil together in Portugal's increasingly extreme climate, where deluges can be followed by many weeks entirely without rain. Not only is there none of the creeping desertification here which marks much of the southern Iberian peninsula these days, there is an abundance of life. Between the oaks, wildflowers flourish, sustaining bees and honey production. Some of the animal, bird and insect life is unique to the cork forest. Mushrooms are harvested that sprout from the root fibres. Livestock like sheep and pigs feast on acorns in the autumn and in turn help fertilise the soil. It being harvest day, these woods are buzzing with people and tractors. 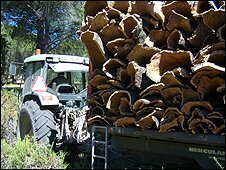 It is exactly nine years since the trees were stripped of the bark that is the main source of income for landowners. And the cork has grown back, several centimetres thick and ready for collecting. Farmers do not risk letting anyone loose on these trees with a sharpened axe. The men putting carefully placed cuts in the bark, and peeling back people-sized chunks of outer tree trunk, have been doing this job for years. "It's like cutting cloth for dress-making", says Mr Ferreira. Conceicao Silva, who works as a forest engineer for the organisation overseeing environmental standards in the industry, adds: "Bring the axe down too hard on the branch and permanent damage could be done, which will rule out generations of future harvesting. "If it's properly managed, what we are looking at here is the ultimate sustainable resource." It will be more than a year before bits of these curved slabs of bark appear in wine bottles around the world. They will have to be slowly dried out in the sun, boiled, graded, shaped and cut. The best - single unadulterated chunks of natural cork - will be safeguarding the finest red wines as they mature for decades. The shabbier parts will be chopped up into little pieces and re-shaped into an amalgam that might seal a bottle of beer or tile-cover a bathroom floor. But cork only grows around the Mediterranean. Wine producers in the Americas, Australia and New Zealand long ago started to rebel against tradition by using plastic bottle-stoppers and metal screw-caps. Many European wine-growers followed suit and, suddenly, cork no longer has the monopoly in what remains its vital market. Two hours away from the harvest, in the streets of the Portuguese capital, Lisbon, wine-drinkers are mostly unaware of the implications of their choice of bottle-stopper. A clear majority of those I talk to come down on the side of cork. "Opening wine just isn't the same without that twist and popping sound", a student visiting from California tells me. "I guess it's the sense of ceremony I like." But, asked which they think is the most environmentally-friendly option, many assume it is best to avoid the natural product. "We shouldn't be cutting down the trees, I suppose," says a couple from Austria. Vanessa Linforth, who manages the Soil Association's forestry programme for the Mediterranean, tells me this is the kind of misconception she spends a large part of her working life trying to correct. "People may have heard misguided campaigns before," she says. 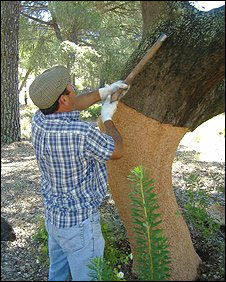 "There was one about eight years ago, claiming cork harvesting was destroying a vital habitat. In fact, it's preserving it. "Recently, I think we've been getting through to people more. Jose Mourinho was the face of a campaign recently encouraging drinkers to 'put a cork in it'". Some non-European wine producers, though, say they have had enough of fighting so-called wine-making tradition - that it has been bad enough convincing importers that high quality wine does not have to come from the ancient vineyards of southern Europe. They prefer the screw-cap, which they do not have to import and which eliminates "wine taint" - the "corked" taste that comes from a chemical present in inadequately treated cork bark. In recent years, Portugal has thrown increasing time and resources at combating cork taint. Pedro Borba, who showed me round a processing plant near the harvesting grounds, and who is personally responsible for rating the quality of the cork, says the amount of wine lost to corking can be reduced to zero with the right precautions. But his main argument for the preservation of the cork is practical. 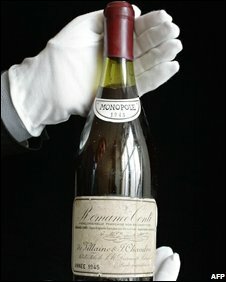 "A twist-off top may be adequate for a wine that is going to be drunk within weeks, even months, of leaving the vineyard," he says. "But for a vintage wine, tiny amounts of oxygen need to enter the bottle to allow proper ageing. And only cork can do that". Nearly 90% of the cork producers' market is still the drinks industry. And the UK is the biggest single importer of wine in the world. Consumers, it seems, bear a heavier responsibility than they might have thought for the future of the cork industry and, very possibly, for the future of a unique Mediterranean environment.